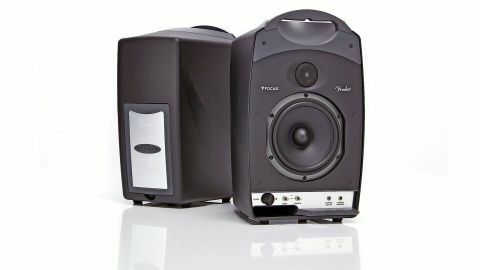 Appropriately flat-sounding, true studio monitors, which also break down into a portable package. It's Focal monitors in a very portable package. As easy as it gets to round up your studio speakers and take them on the road. The price - portable or not, this represents a very affordable way into getting a decent sound. They sound much better than sceptics might think - they're good enough to use all the time, not just for hotels. We wish the connecting power cable was longer. Much as Fender trade on their history with classic guitar and amp designs, they're also pushing ahead with digital amps, iOS devices, and other products, including the Passport series of portable PA amps, where the speakers and mixer lock together to create a secure mobile package. The Passport Studio simply adds a monitoring solution to the existing range of PA solutions. The box contains the monitors, a mains plug, a manual, a cable to connect the speakers to each other, a handgrip, and two panels that attach magnetically to the rear of the cabinets. "You get the impression that everything is designed to tight tolerances, and will work 'just so'"
You get the impression that everything is designed to tight tolerances, and will work 'just so'. The plastic-shelled speaker cabinets slot together, facing inwards, protecting the speakers and tweeters from unwanted impacts in transit. It takes a couple of practice runs before you get the hang of it, but then it's easy to hook them up. The handgrip snaps into place across the top of the monitors, acting as a carry handle while also locking them in place. Seeing the rear panels and the handgrip, we wonder if Fender sell spares, as sooner or later they will disappear. These are active monitors, but only the left-hand one takes mains power; it then attaches with the supplied cable to the right-hand cabinet. This is good because it saves one plug space, but we wish the cable was about 12 inches longer; we could only just stretch it across our studio space, behind an iMac and external monitor. We understand that any similar TRS cable will do, though. The left front panel puts some useful controls and connections to hand - there's a master level control and switches to cut or boost bass and treble by + or - 1.5dB at 75Hz (bass) and 7.5kHz (treble). There are also very useful 1/8-inch connections for stereo headphones or stereo aux in. Hmm, plastic speaker cabinets - is that cool? Let's see. We hooked them up to an RME UFX and they became our regular studio monitors for a while. In fact, we used them for everything; mixing, watching movies, and casual music listening, so we had plenty of time to get used to them. In the manual, Fender recommends 'burning' them in for a few hours before using them for critical applications, but we didn't notice much change in the sound. With the RME they made a super-flat combination, which was a bit dull for home entertainment purposes, and brutally flat for mixing - no glamourisation of the sound at all, and to our ears, even in tone across the whole range. Of course, these are all good things for studio speakers! If you're going to make assumptions and expect the Passports to sound plasticky because of the materials used, forget it. We had a client round who is a self-proclaimed speaker geek, and he complimented them, especially on their mid-range handling. Unlike some other speakers we've used, these aren't tiring to listen to during long sessions, either. We took some mixes we made with these to another studio for comparison, and they translated really well, which is our main criterion for speakers. These are definitely real, functional, studio monitors that also happen to be portable. If you want to connect microphones or instruments, others in the Passport range are better suited; these are monitors first and foremost. We've done many events where we've packed delicate studio monitors in bubble wrap, then crammed them into a suitcase... never again!